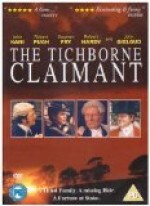 The Tichborne Claimant affair was the celebrated 19th-century legal case of Arthur Orton, who claimed to be the missing heir Sir Roger Tichborne. In April 1854, Sir Roger Charles Tichborne was homeward bound from South America, when his ship was lost at sea. When the news reached her, Roger’s mother refused to believe he was dead. She inquired all over the world, and in November 1865, heard from a Sydney lawyer claiming that a man fitting the description of her son was living in Australia. The supposed Sir Roger was actually Arthur Orton ( Note: there is some evidence he could have been the illegitimate son of Roger’s father James). Aside from a superficial resemblance to Tichborne, he did not fit the description well; however Lady Tichborne was desperate enough to accept him as her son and sent him money to come to her. Orton was seemingly reluctant to go at first, however, a former family servant, Andrew Bogle, accompanied him on his trip to Britain. He arrived in London, December 1866 and visited the Tichborne estates. When he travelled to the Paris hotel where Lady Tichborne was living, she recognised him as her son. She even handed him Roger’s letters from South America, and she gave him an allowance of £1,000 a year. After Lady Tichborne’s acceptance, other members of the Tichborne family were outraged, and unsurprisingly declared him an impostor. They found many discrepancies when Orton tried to fit his own South American experiences to those of Sir Roger. When Lady Tichborne died in March 1868, Orton lost his most prominent supporter. It was unfortunate also for the cause of truth, for she died before she could testify in the witness box. By this time, Orton owed a significant amount of money. (He sold “Tichborne Bonds” in music halls to pay the legal costs when he tried to claim the inheritance.) The rightful heir at the time, Henry Doughty-Tichborne, was only two years old. The claimant, in the eyes of the public, had become a `cause’.. The trial began on 11 May 1871, and lasted 102 days. Orton weathered the attacks against the discrepancies in his story and his outright ignorance of many key facts Roger would have known, including how to speak French. Over 100 people vouched for his identity as Sir Roger, with the black manservant Bogle a key witness. Since Bogle had primed Orton, over a considerable period, on everything he knew of Sir Roger and the family, one asks, for what motive? Money, or revenge for actual or perceived wrongs during his seemingly exemplary service? Or a desire to fulfil Lady Tichborne’s wishes? Eventually the evidence of the Tichborne family convinced the jury. On 5 March 1872, Orton’s case collapsed, and only then, could the extent be seen, of the overwhelming evidence against the Claimant. For his supporters, it was a classic example of utter gullibility, the habit of clinging to an opinion on an uncritical basis, preferring prejudice over reason. In retrospect, it is incredible that the finest legal intellects of the day, Coleridge, Cockburn and Hawkins, had to exert all their powers to unmask the fraud. Orton was promptly arrested. His criminal trial began in 1873 and lasted 188 days, before the judge, Sir Alexander Cockburn. The jury was eventually convinced, by, for example, testimony by Orton’s former girlfriend, that the Claimant was false. Orton’s defence was led by Edward Kenealy, who would later be disbarred for his aggressive behaviour during the case. Orton was convicted on two counts of perjury on 28 February 1874, and was given a 14 year sentence. A persistent mystery is how such a man as Edward Kenealy, Q.C. converted himself to the belief that such a fraud as Arthur Orton was Sir Roger Tichborne? Those who had supported the Claimant’s efforts refused to believe the verdict, and protested he was unjustly persecuted. In April 1875, Edward Kenealy failed to convince Parliament to review the case. As a result, Orton’s supporters started a riot. It is always a poor cause which has to be supported by abuse, misrepresentation and quibbling. Orton was released from prison in 1884, by which time the public had forgotten him. He sold his confession, but later retracted it, arousing little interest. He died in poverty on 2 April 1898. His coffin bore the inscription ‘Sir Roger Charles Doughty Tichborne’. 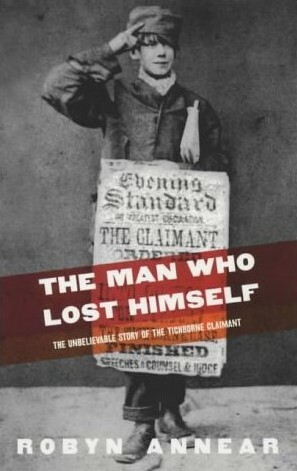 Two fascinating facts, although not explored in the film, feature in the best book I have read about the case ‘ The Man Who Lost Himself ‘ by Robyn Annear, firstly, that Arthur Orton (the claimant) may have been an illegitimate son of James Tichborne, Roger’s father, accounting for certain physical similarities that may have helped convince Lady Tichborne of the claimant’s genuineness, assuming she did not purposely leave a legacy of anarchy for the family she disliked, and of course giving Arthur Orton a higher motive than pure financial gain. Secondly, the amount of testimony from individuals in Australia, that Roger Tichborne had arrived there, and had not drowned with the loss of the ‘Bella’. If true, and assuming they met, light is shed on Orton’s motivation for claiming the baronetcy. In the end, so it seems, the claimant was the only one who truly believed in himself.